As close to Linken's Sword of Mastery as we're going to get these days. Holy hell this is going to get farmed. If you want it for transmog and are Alliance, go for Legacy of Teronis instead. 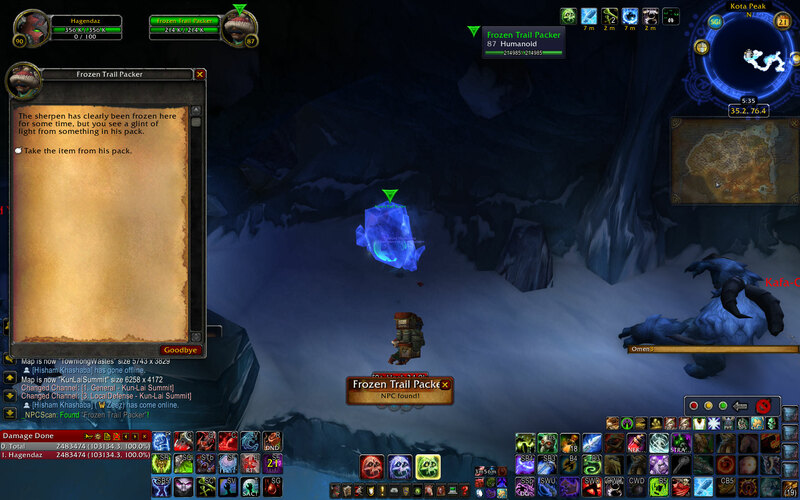 Just a quest reward in Ashenvale, much quicker and easier. No farming needed. This blade can be obtained by clicking on a particular jade statue in the garden of The Jade Witch. The statue sort of acts as a 'container', in that you are taking the blade off of it. It sparkles like all the other containers or hidden "Lost and Found" items in Pandaria. It will be one of the statues in the FRONT yard, not in the back inside the water. Not sure if the statue part in the previous post is true or not. If it is, then you must get this item before killing the Jade Witch. Once you do all the statues in the front of her house vanish. Just found this on my alt. The statue appears on the right side of the front of the house and is a big panda, colored green mind you. The overused 'gizmo' mouse isn't the cause here. You need to chat with the statue. It sparkles and holds the sword in his hand. Edit: Relogging seemed to fix my counter :)! So relog if this happens to you too! if you have finished the quest , the statue still can show up. and the others are gone . means that it is more obvious to find it. You have to interact with Jade Warrior Statue. The statue is in the front garden (if spawned). For more information about Lost and Found check out my list at the achievement site. Just wanted to note that I was able to get this during the quest where you control the Orc when you first find out about the Jade Witch. Was pretty surprised to get a BoA blade when I thought I was just inspecting a statue for the quest! Upon comparing the screenshots on this page with the 3D model of Jade Warrior Statue, along with the coordinates of that NPC matching the coordinates reported on this page, I do believe that NPC gives this sword. Have been using this sword from 85 and up on a Protection Paladin. It does proc quite a bit, stunning a single enemy for a few seconds, which is pretty nice. Currently level 89 and don't think I'll replace it until I get a 450 ilevel weapon, and even then I'm sure I will miss it. Hi I can't believe this information wasn't on this page! I stumbled upon this today and realized that the NPC itself in question was TARGETABLE! Which made me realize, it's an NPC! And as such, it can be added to _NPCSCAN! Jade Warrior Statue is the NPC that rewards you the item when spoken to. Thus, adding ID 64272 to _NPCSCAN will allow you to track it! This should make it a LOT easier for you guys in your hunt. Found this at 39.24 46.64 at 9:03 am realm time Shattered Hand. 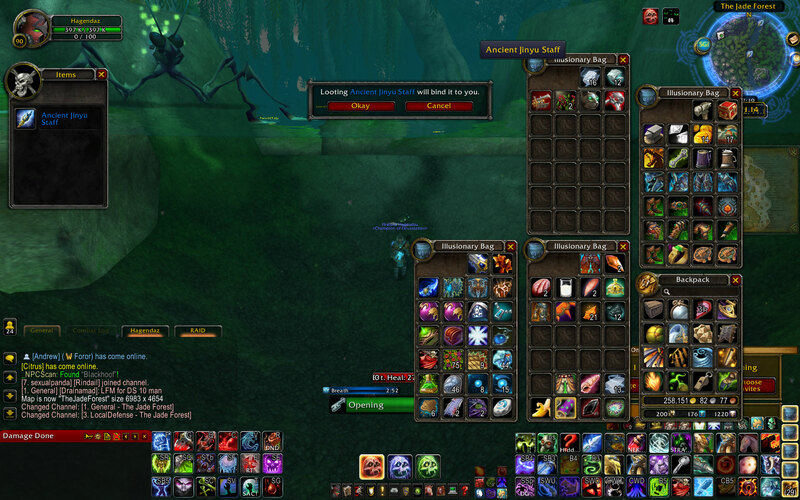 note that if you try to loot it while your inventory is full, the item will Disappear. 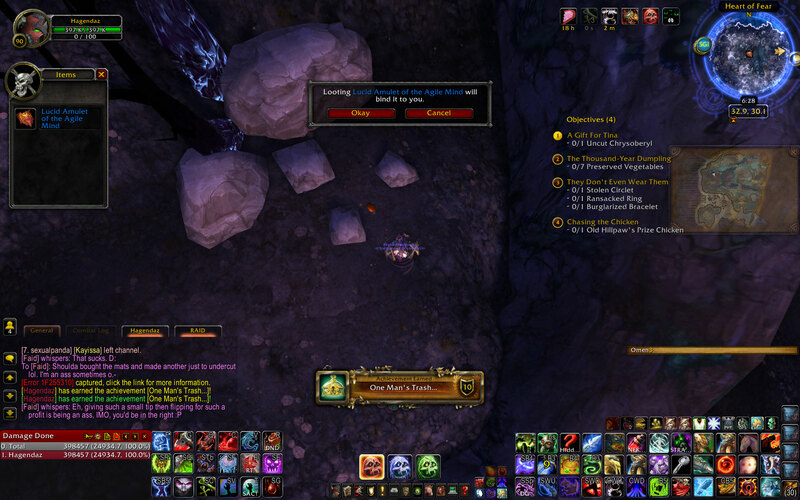 Obtained this at 4:48am 10/15/12 Hagendaz - Argent Dawn US. NPCScan can in fact be used to track this rare since you talk to an NPC to get it. The ID of the NPC is: 64272) For a better idea on what exactly the NPC looks like and the location of it you can check Here. Picture NPC Scan pop near mountain. Note: you don't need to go inside for it to pop up obviously. This makes looking for the NPC more efficient. Picture Me actually near the NPC about to "take the item from his pack" and receive item. Sprite's Cloth Chest (3:37am 10/31/12 Found within the Pranksters' Hollow cave in Eastern Kun-Lai Summit. You can find the location easily by finding the Needle Sprite's outside the cave. The chest is located at the very end of the cave near the two Perma-Dead sprites. I have posted this same list under all the rares I've obtained with information pertaining to each rare page as I find most of the information useful and feel others will too. Make sure you have a spot for it in your bags. My inventory was full when I clicked on him and said "remove the dagger from his hand". The statue despawned before I could drop an item from my bags. 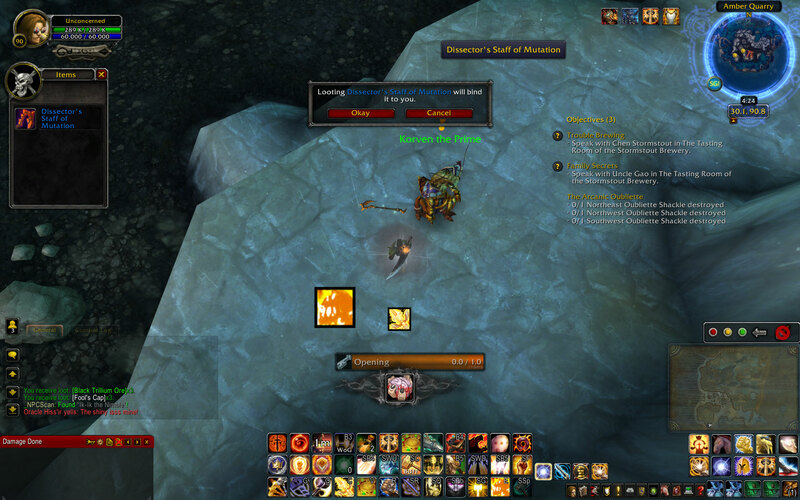 I've looted this blade twice on two different characters and had my Frost DK dual them for a Jade Temple dungeon run. With them, I was able to stun Wise Mari while he was casting Hydrolance - which resulted into an easy kill as we didn't have to frantically run around the room anymore to avoid the water jet. Was pretty awesome! Would like to add that on an Alliance character you can interact with the statue while doing the Jinyu portion of the Story Telling quest line. I had been camping this on my main, decided to level an alt for a little bit and was stunned to see it while technically located down on the southern end of the zone. This sounds similar to what draxenale was talking about a few posts above, just the option faction's version of the ques line. In adition to stun It has the same proc as No'Kaled, the Elements of Death. 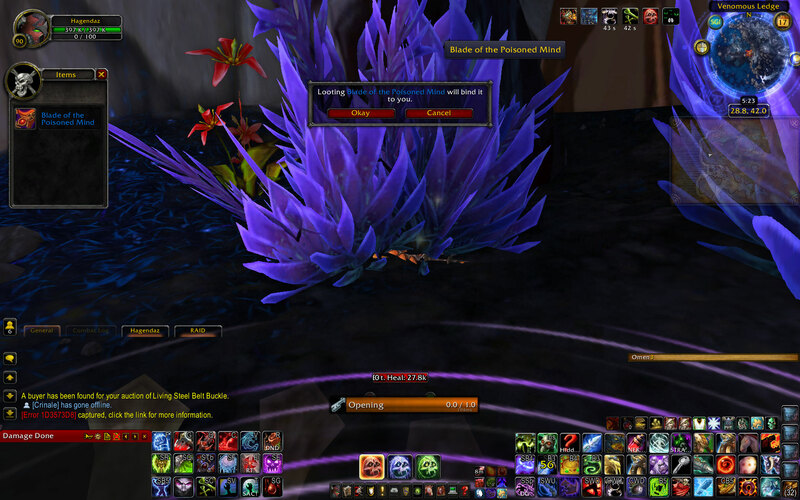 I was using it as OH on Frost DK during leveling when I noticed weird icons in on-screen damage text, skada has showed Flameblast, Iceblast and Shadowblast in my damage done. Skada's log also showed that total summ of procs of these three spells was equal to ammount of procs of Jadefied. Further testing confirmed that these magic bolts happen at same time as stun. Dummy confirmed that it was this particular sword and not whatever I had for pair. Probably a coder's mistake. To insignificant to be exploited in any way and warrant a fix. Not sure if it was mentioned here before, but i was able to find the statue and loot the sword while on the quest SI:7 Report: Hostile Natives (the one where you follow the story of Sully and Little Lu), which includes some sort of phasing. Can't confirm if the item was or wasn't spawned at same time in "real" Jade Forest. WORST quest I have ever been on! 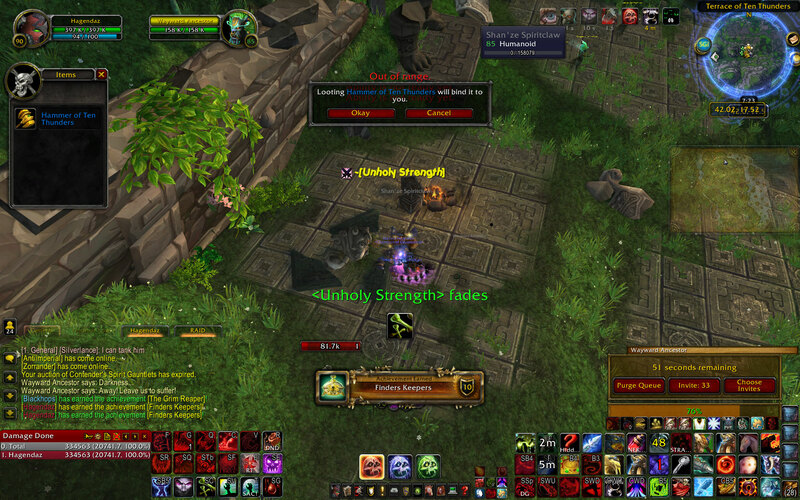 My pally has looked for the start of this quest now well over 6 hours. Now I keep seeing coments about the questline being removed from various soarces. The kicker is I just seen a dwarf trigger the jade witch quest. All information about this quest is so vauge I cant find the start of the questline. Nobody on my entire server can give me a definative place this quest starts.IF YOU WANT TO RUIN YOUR ENTIRE DAY OFF go after this sword. A huge thank you to Hagendaz1337 (scroll down to see it) for his post with screens and coords on many of the weapons found around Pandaria. I have gotten 5 of them now simply by parking my rogue at the spawn points and logging in to check between BGs and Dungeons. The only advice I can really offer is to be patient. It may take a few days to see a spawn but eventually you will be the lucky one and log in to find a sparkling weapon to loot. As for this weapon, I have parked my 90 rogue (long ago completed the aforementioned quest line) and lvl 86 DK (who is phased to the quest line) at the mentioned location. Its been 24 hours with nothing but I don't anticipate waiting more than a couple days like I did with each of the others I have found. You can use Runeforging on the weapon. After I added the runeforge, I mailed it to my paladin. 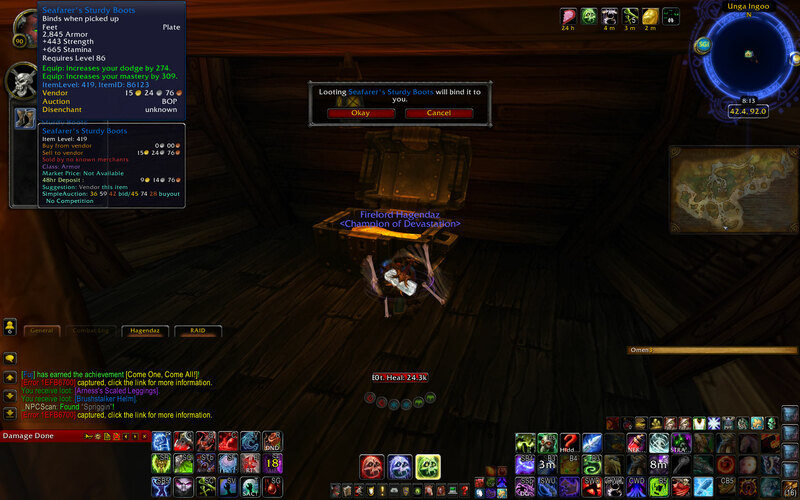 When it was still in the mail box, the enchant was still intact with red text, as soon as the item was looted the runeforge was removed from the weapon. Sorry if this is duplicate information, I didn't see it in the comments prior to posting. Bit strange this that there are no statues at all when i go there with my Alliance Druid. No NPC stood in the doorway either. As far as I can tell, I've done all the quests in the jade forest? Anyone else have this problem? (this may be better if I posted on the forums, just noting it here in case anyone came here with this problem - you are not alone). There is a "FLAG - quest" ( FLAG - Jade Infused Blade ) for picking this up - so you can only do it once per toon - ever. Here's a little macro you can run to see if you've already opened it. A result of "True" (1) means that you have it already, and "False" (nil) means you haven't picked it up yet. I wanted to know if the weapon's proc would cause a diminishing return timer on stun effects so I went for testing. The proc doesn't cause a DR on stuns. For Lvl 85 I'd recommend Mantid Sky Reaver. That one has a higher iLvl and the option to upgrade the weapon. I almost just vendored this until I noticed it was blue and then that it was bind to account, so I came here to find out what it was and rofl. I talked to the statue (to get the "take it from his hand" window) and told my sister to try it too. We were both able to click the speech option. Each of us completed the quest and each of received the sword in our inventory. Presumably, as long as you get the speech window open (step 1 of 2 interactions to complete it) any number of people can then complete step 2 and get the item. Long story short: if you're in a group, have both party members open up step 1 before either does step 2 and you can both get one. I stumbled across this in my bags today in Orgrimmar looking to free up bag space. Didnt even know I had it or where it came from. I dont remember receiving it, but thats why we have WowHead. I guess I did click on those Jade statues when questing around there. I feel for you campers. Ive camped spawns for years mostly to no avail and conversely Ive bumped into my share of rares and purples and such, but its never anything useful for me and most of them ended up on the AH. I guess ill probably just vendor this, it could be fun for a Furry warrior or DW DK for a couple levels. Dont really get the Account Bound part of it, sense it has the lvl 85 requirement, wish it scaled with the player, Id hold onto it then. Too bad we cant trade/give stuff like this to other players who could use it. I just dont think its worth wasting a bank slot waiting on me to level up a Furry W or DW Frost DK to 85 to get a couple levels of fun out of it. Probably more like a handful of fights. But this does put things in perspective a little, such as the items ive coveted over the years probably weren't worth the time or trouble to begin with either. This item is lootable while on the quest scouting report: hostile nativesScouting Report: Hostile Natives as i just looted it myself. FYI - it's not just heirlooms that you can ship cross-realm now. 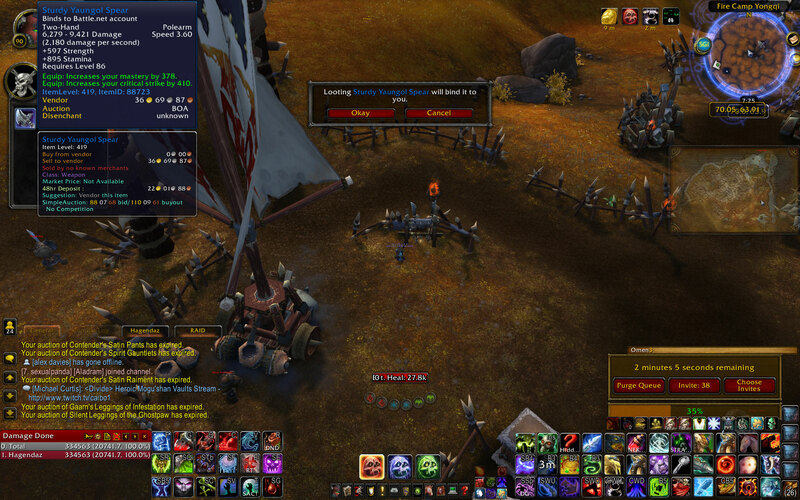 I just mailed this from a character on Draenor to a character on Blackhand. Very happy little paladin. So, for those intrepid souls who farm this fab gear for more than just a sweet wep at a (relatively) low level, this is one to leave to the very last. Can this be used on at any level like an heirloom item or is this a level 85 only weapon? Today, day 4 of checking for it, I found it in the regular world once I got there! So don't fret if you have already done the quest, you can still find it in the regular world as well as in the instanced! Equip: Your melee attacks have a chance to encase your enemy in jade, stunning them for 3 sec. Only works on creatures level 90 and below. Does not work on players. This item is needed for The Relic Hunter and Is Another Man's Treasure. To learn more about getting this title, check out Wowhead's exploration guide to The Relic Hunter!